The Kindle Fire has some excellent accessibility features, but if you test them out you may find yourself having trouble turning them back off again. Let me help you with using these features as they can be a fabulous benefit, or a little Kindle Fire problem if you can't turn the accessibility off once it's on! 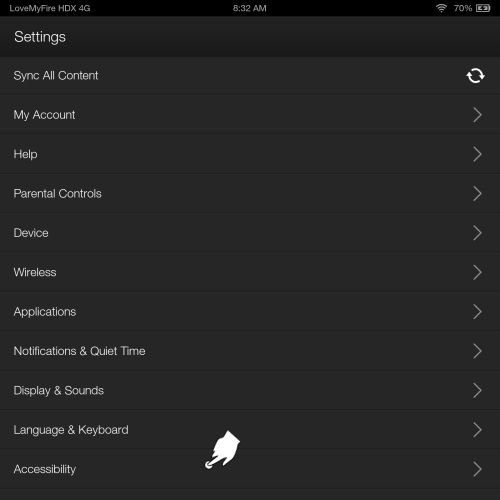 FYI: All Kindle Fire tablets except the first generation (2011) come with accessibility features. If you're not sure which version you have see my Kindle Fire infographic for help. 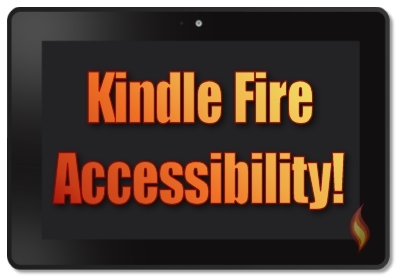 First, let's list go over the available accessibility features that come with your Kindle Fire. To find yours, slide down the quick settings menu, tap "More" or "Settings", and tap "Accessibility". Now I'll briefly go over these features so you have more of an understanding of how they work. The Voice Guide and Screen Reader are basically the same thing in that it turns on a voice that will either read out loud what is currently on the screen or make a sound when you tap something, such as the back or home buttons. The main difference between the two Kindle Fire accessibility features is that one is on the Kindle Fire HD (2012) and the other is the HD & HDX (2013 releases). The voice even lets you know when you connect or disconnect your USB cable to another device (ex: PC) or to the charger. Cool! 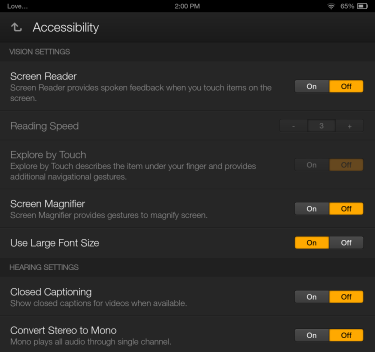 This Kindle Fire accessibility feature is great for those with visual impairment who need additional voice help to describe items being touched and new screens that are visited. It also comes with additional navigation gestures. Let me repeat that last part as it's important: this feature comes with "additional navigation gestures". These gestures make sense but if you don't know what they are or how to use them and this feature is turned on (accidentally or on purpose) then you're going to have trouble turning it back off. "But," you ask me, "I didn't turn accessibility on, so why is it on?" Oh, I believe you! That's because there's a short cut for turning on your Kindle Fire HDX's accessibility which you (or anyone else who has your tablet) can accidentally trigger without realizing it. Here's how this quick "feature" works. 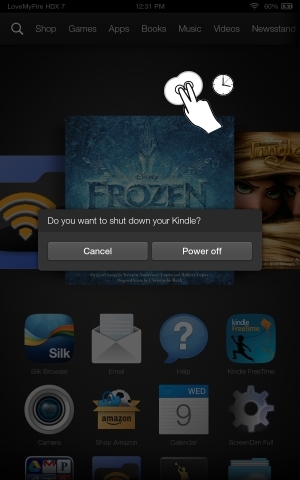 When you hold down the power button for a few seconds the "Do you want to shut down your Kindle?" window pops up. While that window is ON if you tap and hold down with two fingers anywhere on the screen for at least five seconds the accessibility reader will come on and say, "Continue holding down two fingers to enable accessibility." If you continue to maintain the two finger contact then both the Screen Reader and Explore by Touch features turn on. If you let go, the accessibility will be canceled. One of the problems is that this will happen even when your sound is off, thus you don't hear the reader come on to warn you that you're about to turn accessibility on. It's also easy to be holding your tablet in a way that causes a simulation of the "two finger hold" without you realizing it and if that happens when the shut down window is up... well, accessibility will be turned on. Unfortunately, I have not discovered a similar quick feature for turning accessibility back off, so we'll have to learn how the normal way. I'll go over how to turn this feature off in a moment, but first let's go over the other accessibility settings. This feature is exactly the same as the auto-rotate lock/unlock option located in the quick menu settings that you slide down from the top of your screen. This makes the orientation lock, in my opinion, redundant and unnecessary which is probably why it was removed from the 2013 tablets. When the Screen Magnifier is turned on, you can magnify your screen to read items easily. 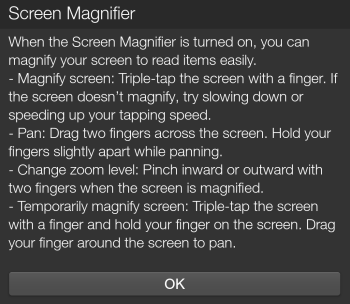 -Magnify screen: Triple-tap the screen with a finger. If the screen doesn't magnify, try slowing down or speeding up your tapping speed. -Pan: Drag two fingers across the screen. Hold your fingers slightly apart while panning. -Change zoom level: Pinch inward or outward with two fingers when the screen is magnified. -Temporarily magnify screen: Triple-tap the screen with a finger and hold your finger on the screen. Drag your finger around the screen to pan. When you correctly tap three times at a speed your Kindle Fire will recognize, the screen will zoom in and be surrounded by a blue border. If you're still on magnify, just do another triple-tap to exit the magnifier. You'll still need to turn this feature off in the accessibility settings if you no longer want to use it. This feature will slightly increase the font size in the settings and a few other areas where you find text, like the names of your apps and music. Here's a visual of the minor amount of font increase when this is turned on for my Kindle Fire HDX 8.9". This Kindle Fire accessibility feature turns on closed captions of movies and TV from Amazon Instant Video and any other videos that have closed captioning available when played on the web (Silk Browser). Closed captioning is an important feature for those who are deaf, hearing impaired, hard of hearing, or need help understanding what is being said. When I was in 8th grade I met a young girl who was deaf and we wrote back and forth in a notebook to be able to communicate. She told me that her mom taught sign language community classes, so my mom and I signed up. We ended up taking the beginner, intermediate, and advanced classes and later my mom continued on at the local university. She's now been a sign language interpreter in a school district for 22 years and is retiring this year! Over the years I've still used some sign language, including with a close friend who although she can hear, is unable to speak due to a childhood illness (she signs to me and I speak since she can hear). I've really seen how important closed captioning and other accessibility resources really are! I even use closed captioning myself at times to help me understand certain movies and TV shows, especially when characters have strong accents, like those in the BBC series of Sherlock- I have the hardest time understanding what they are saying! 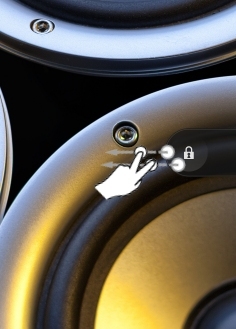 This Kindle Fire accessibility feature will disable stereo sound and instead plays all audio sounds through a single channel. What this means is that instead of a sound coming through the left speaker/headphone while another comes through the right speaker/headphone both sounds will come through both speakers/headphones. Have you noticed when watching a movie in the theater that when you see something, like glass breaking on the left side of the movie screen the sound comes from the left side of the theater, while other sounds come from the right. That's stereo sound which simulates the way our ears process sounds. Mono sounds are a combination of all the sounds from all locations vs splitting the sounds. if you're hard of hearing or have limited/no hearing in one of your ears, this accessibility setting would be very beneficial to use, especially if you're listening with head phones. This way you'll more easily pick up all the sounds since they aren't being split between speakers/headphones. Make sense? Alright, now on to the main event! Obviously turning these features on is fairly easy while turning them back off is just as easy... unless you turn on the Explore by Touch feature, then you might have a little trouble (I did) even if you know what you're doing. Part of the issue is that when you turn on the Screen Reader (HDX tablets) the Explore by Touch feature is automatically turned on too and although it shows you a tutorial on how to use this feature, it's not as easy to use as it seems. As explained earlier in this article, the way to scroll or move an item when the Explore by Touch setting is on is to use TWO fingers when swiping. If you have enabled a password you will need to tap it in and then tap OK as usual. Sometimes swiping down the quick settings menu is easy to do, but at other times it can be a nightmare! I've found that it's fairly easy on both HDX tablets, but on my HD 7" (especially when in portrait view) I have tried AGAIN and AGAIN without success. This is definitely one of the most frustrating things I have experienced on any of my Kindle Fire tablets! The Screen Reader and Explore by Touch will finally be turned off and you can go about using your tablet as normal. Whew! :) That was quite a lot of steps to turn off the Kindle Fire accessibility wasn't it? Alright, for those of you who may experience extreme difficulty in accessing the quick menu bar (and thus the settings) while the Explore by Touch feature is on, here's my little tip that might help. To help show you both how easy and difficult this can be, here's a little video I put together. Using YouTube's mobile site to view videos as explained in the linked tutorial. Please give my video a thumbs up if you found it helpful (you need a Google account to do so) and be sure to subscribe to my YouTube page, LoveMyFireVideos, for future Kindle Fire videos. With a little practice you'll get the hang of it! Maybe I'm missing something, so if you know of an easier way to get this to work please let me know in the comments below. Now you're ready to learn some more Kindle Fire tips or check out other common tablet problems you might be experiencing.